Seven crows were captured by skin-masked researchers, then tagged and released back onto the college campus where they were found. 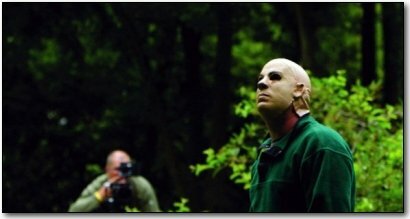 Thereafter, whenever the crows saw the researchers walking around campus in those masks, they would "scold" them and dive-bomb them. All that cawing we humans hear...that's not just noise. 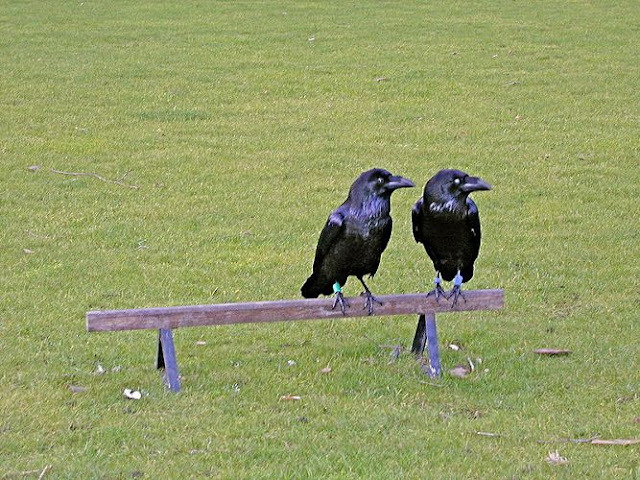 Crows talk to each other. 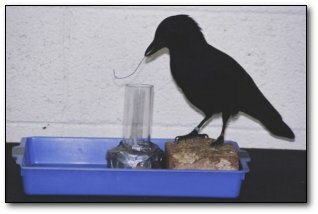 Multiple crows who never actually saw the original researchers, above, were able to recognize them all the same. 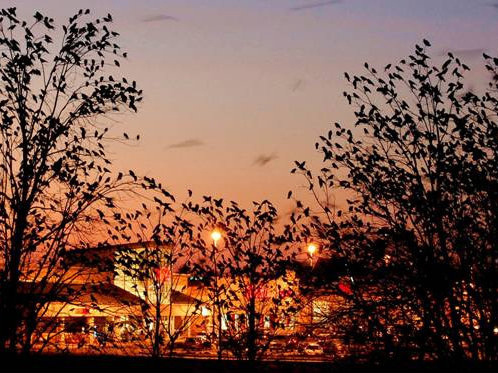 Every year, half a million crows used a city in Ontario as a rest stop on their migration route. These crows ruined crops, stole things, and messed everywhere. The Mayor declared war, and the citizens all turned out with their guns planning to shoot at least 300,000 of these crows. They shot one. Just one. And the rest disappeared! Half a million birds, gone. And every year since, the crows fly high enough over this town to avoid any stray birdshot. This is not an isolated incident. 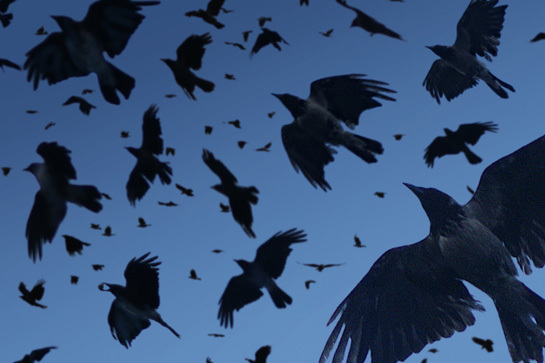 Crows have changed whole migration patterns to avoid farms or cities where a fellow-crow has been killed. Generations later, they still remember. They have a collective mental map that pinpoints where each measly crow was killed. Why is that scary? In a test, food was placed in the bottom of a glass tube, and two pieces of wire, one hooked and one straight, were placed nearby. Abel, the male crow, grabbed the hooked wire. Betty, the female crow, took the straight wire, bent the end into a hook, and pulled the food out of the tube. These two crows had never seen wire before and, incredibly, they didn't do any trial and error learning. Which means crows can reason to a certain degree and take action decisively and effectively. In the wild, crows make effective "knives" out of stiff grasses and leaves. They even use these knives to make other tools. Why can that be frightening? Crows stash food away in little hidden caches; sometimes thousands of them, for the future when times might be lean and they're hungry. 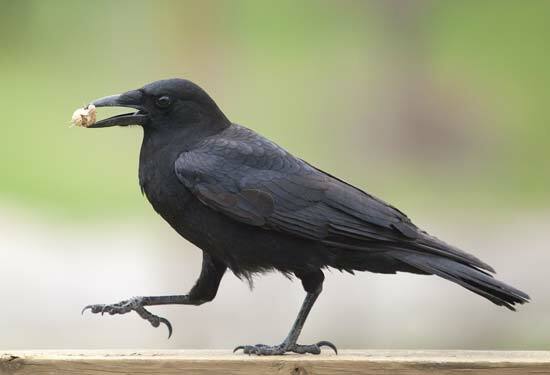 If other crows are watching, they even pretend to hide food in one spot, then secretly switch to another spot. The thing is, even after a long period of time crows remember where all their caches are. What's unsettling about a memory like that? They also drop nuts in front of cars and let cars run over them. What day of the week do the garbage men come to your block? What day do they service the next block over? And the one after that? And after that? If you don't know the answer to all of those questions, then congratulations! You're not stalking your garbageman. ... But don't get too excited, because it also means you've just been outscored on a test by a bird: ... crows simply memorize a driver's schedule, then follow the trucks to pick out anything tasty. So what's the big deal? So a flying animal numbering in the millions recognizes faces, remembers and communicates minute details, makes weapons, reasons effectively, takes decisive action, and stalks humans. they also know your address. Amazing! God's Creation never ceases to astound. Thank you so much for your blog. I love reading new finds to the kids. Thank you, Cathy...to God be the glory.